Inspired by traditional recipes of Root Tea, ROOT is distilled from home-grown, organic sugar cane and produced by Art in the Age — a Philadelphia-based group dedicated to creating high quality works of art and craftsmanship. 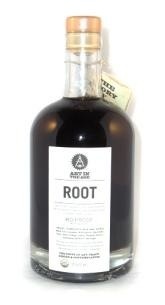 Inspired by traditional recipes of Root Tea, ROOT is distilled from home-grown, organic sugar cane and produced by Art in the Age — a Philadelphia-based group dedicated to creating high quality works of art and craftsmanship. After distillation, Art in the Age's ROOT is infused with a dozen different organic herbs and spices, including wintergreen, spearmint, cinnamon, clove, cardamom, allspice, birch bark, anise, smoked black tea, lemon, orange and nutmeg. The result is not like a flavored vodka or a sweetened liqueur — it is a spirit unlike anything made in the last century. The nose is sweet and aromatic, much like root beer. The initial notes of anise and licorice fade quickly, and strong notes of birch, peppery herbs, citrus and vanilla beans predominate.